WARNING Do not place anything on top of the cover: Placing luggage or other cargo on top of the luggage compartment cover is dangerous. During sudden braking or a collision, the cargo could become a projectile that could hit and injure someone. The vehicle has a light weight luggage compartment cover to keep the contents of your luggage area out of sight; it will not retain heavy objects that are not tied down in an accident such as a rollover. Tie down all heavy objects, whether luggage or cargo, using the tie down hooks. Make sure luggage and cargo are secured before driving: Not securing cargo while driving is dangerous as it could move or be crushed during sudden braking or a collision and cause injury. CAUTION Make sure the luggage compartment cover is fi rmly secured. If it is not fi rmly secured, it could unexpectedly disengage resulting in injury. 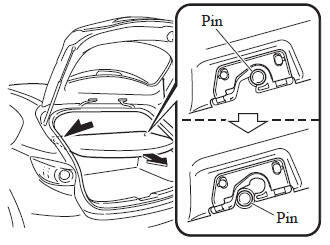 The luggage compartment can be accessed by opening the liftgate when the straps are attached to the sides of the liftgate. This cover can be removed for more room. Remove the straps from the hooks. Lift the end of the luggage compartment cover a little, pull it outward, and remove it from the pins. Lift the front end of the luggage compartment cover and remove it. Up to two golf bags can be carried in the trunk. Place the bottom of the first golf bag in the trunk with its bottom pointed to the left and fit it into the front of the trunk. 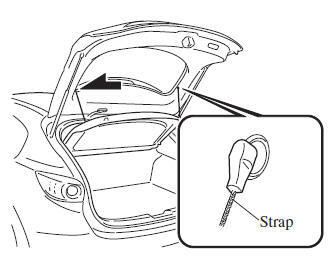 Place the second golf bag in the trunk with its bottom pointed to the left and fit it into the back of the trunk. NOTE Some golf bags cannot fit depending on their size.